Brazil is in the midst of a serious economic crisis. The country suffered through its worst recession on record during 2015 and 2016 and the economy is expected to grow by less than 0.5 percent in 2017. After two consecutive years of stagnant economic growth, the quality of life for working class Brazilians continues to decline. The underwhelming economic performance has lead to increased unemployment, low levels of domestic investment, and declining household incomes. The macro-economic and political policies implemented by unelected President Michel Temer have worsened the country’s economic performance. The Temer administration attributes the current economic crisis to excessive public spending. In their mind, the only cure for exiting this downward spiral is through implementation of regressive austerity measures and cuts to essential government social welfare programs. In other words, any spending included in the budget that fails to correspond with the priorities of fiscal austerity, is considered superfluous and inefficient. Similarly, many economists argue that Brazil’s economic woes are being exacerbated due to the implementation of austerity measures. During economic downturns, economic recovery is usually achieved through increasing domestic investment during periods of slowed economic growth, commonly referred to as counter-cyclical policies. In the last two years, low-income workers, which in Brazil, is largely comprised of women, Blacks and young people, have disproportionately suffered due to the government's pro-cyclical economic policies. (A) One of the main features of economic crises’ is the significant increase in unemployment. This is particularly true in the case of Brazil. Currently, the unemployment rate among young people from the ages of 16-29 is 25 percent, according to a recent study carried out by IBGE. This means that one out of every four young people is unemployed. (B) The increase in unemployment is not exclusively due to job dismissals and company closures. Prior to the economic crisis, the percentage of unemployment among young people was lower due to higher household income earnings along with higher employment rates. However, in recent years, many household income earners have seen declines in their wage earnings. In other cases, household breadwinners have lost their jobs. In order to compensate eroding household incomes and rising unemployment rates, young people have been forced to enter the labor market prematurely. 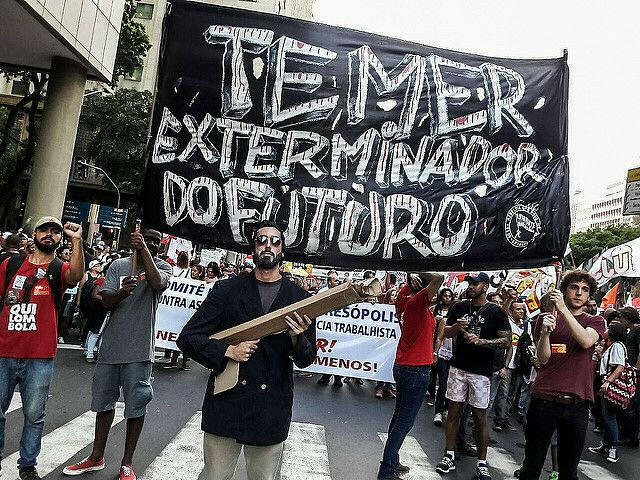 (C) Meanwhile, the institutionalization of budget cuts through constitutional amendments, known as the EC-95, which placed a freeze on all federal expenditure for the next 20 years, will undoubtedly have severe implications on Brazilian youth. The constitutional amendment, which was introduced earlier this year, imposed a freeze on spending in the area of education. Over the next 20 years, government spending will be adjusted according to inflation, which means that there will be no growth in education expenditures over the next two decades, even if the federal revenue grows. It has been projected that EC-95 would have the impact of reducing education expenditure by more than R$45 billion by 2025. (D) Another negative byproduct of the ongoing economic crisis on young people is that turnover rate also tends to be higher among young people. This essentially means that in an times of slow economic growth, young people are normally the first employees to get fired or let go. (E) Finally, another example, which has repeatedly made headlines here in Brazil, is the increase in transportation fairs for Brazilian students, which student activists argue is an unjustified increase given the state of public transit services. These are just a few examples that help to explain the negative social and economic repercussions of the ongoing economic crisis on young Brazilians. If these are collective problems, then we me address them collectively through the strength of our popular organizations! *Juliane Furno is completing her doctorate in Economic Development at UNICAMP and is a member of the Brazilian social movement Levante Popular da Juventude.